I am highlighting these because many leading indicators overall strongly suggest that an employment slowdown is coming. The following more leading numbers in the report tell us about where the economy is likely to be a few months from now. With one exception, these either decelerated or outright declined. the average manufacturing workweek was unchanged 40.7 hours. This is one of the 10 components of the LEI. It is down -0.6 hours from its peak during this expansion. Manufacturing jobs declined by -.6,000. YoY manufacturing is up 209,000, a big deceleration from last summer’s pace. construction jobs rose by 16,000. YoY construction jobs are up 246,000, also a big deceleration from last summer. temporary jobs declined by -5400. YoY these are up +44,900. These are only up 3700 in the past 5 months, a big slowdown. the number of people unemployed for 5 weeks or less fell by -68,000 from 2,194,000 to 2,126,000. The post-recession low was set 10 months ago at 2,034,000. While we are waiting for tomorrow’s jobs report, let’s step back for a moment and look at where we are in the big picture of the economic cycle. Yesterday I looked at manufacturing jobs, and goods-producing jobs generally, as two what to look for in Friday’s jobs report. Today let’s follow up with temporary jobs, an acknowledged leading indicator for jobs as a whole. 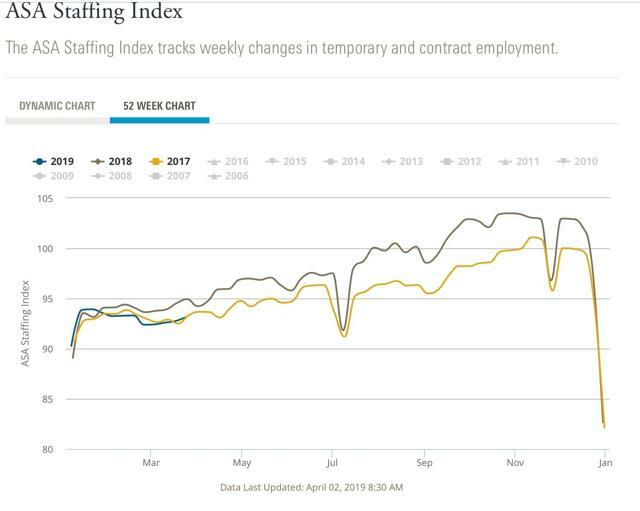 As I wrote about a couple of months ago, the American Staffing Association’s Staffing Index does a good job forecasting the trend in temporary jobs in the monthly employment report. The index went negative YoY at the turn of the year, and has gradually deteriorated since. 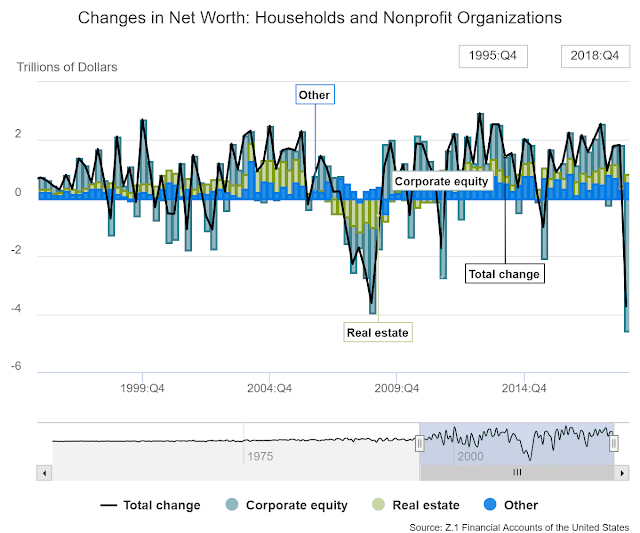 Along with fourth quarter GDP, corporate profits for the the fourth quarter was also reported. Profits growth was either quite strong or very weak depending on how you looked at them. 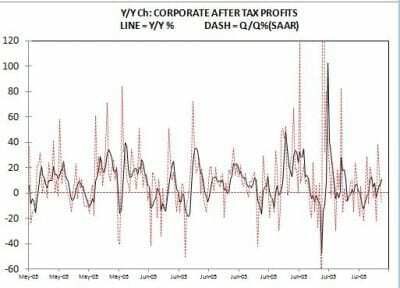 On a year over year basis, after tax profits growth was 11% and appeared to be accelerating. 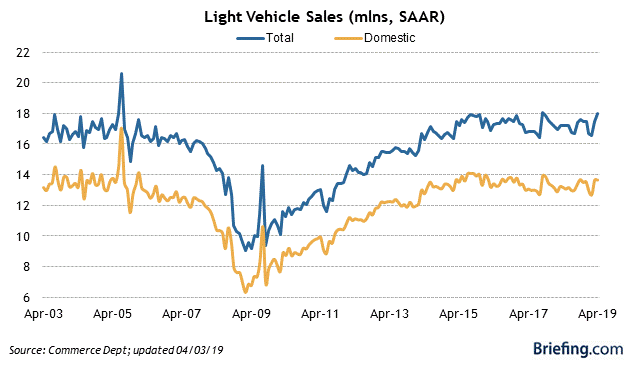 However, on a quarter to quarter basis after tax profits actually fell -6.73% (SAAR) in the fourth quarter and that is after a third quarter annual growth rate of only 3.7%(SAAR). By comparison after tax profits growth surged 38.4 % (SAAR) and 14.0 % (SAAR) in the first and second quarters, respectively. Much of this early 2018 growth was due to the tax cut. But now that the tax cut is behind us, it looks like the Administrations promised strong growth remains just that, a Republican forecast and we all know how seriously to take them. 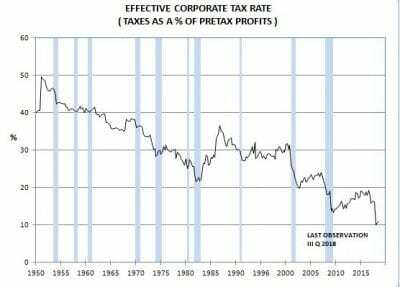 After this it looks like a good time to look at the impact of the corporate tax cut on the effective corporate tax cut — taxes as a share of pre-tax profits. The effective tax rate fell from around 20% to just over 10%. That sounds like a big drop, but compared to the historic trend where the effective tax rate has fallen from almost 50% in 1950 to just over 10% now it does not look like such a massive tax cut after all. Moreover, as the data shows the big impact appears to be behind us and is unlikely to provide much of a boost to growth in 2019. It also raises serious questions about the Republican promises to eliminate loopholes and other special arrangements so that the revenue loses from lower corporate taxes would not be significant. I have not seen them make much of an effort along those line. But maybe I am missing something and commenters can point out such legislation. Along with jobs and wages, household and personal income and spending are my main focus on how average Americans are doing in the economy. We’ll get the next jobs report a week from now, but today we got – almost updated to the present – January personal income and February personal spending. Corporate profits deflated by unit labor costs are a long leading indicator. Since these costs were already reported at +1.6% q/q, that means that adjusted corporate profits were down about the same percentage. >Earlier, proprietors income for Q4 had been reported at positive, but that is a less accurate placeholder. In contrast, Q4 corporate earnings for the S&P 500, with 99.7% reporting, declined over -3% q/q. This means that, in Q4 of last year, almost *all* of the long leading indicators declined, the first time that has happened since – perhaps not coincidentally – shortly before the last recession. Housing data, in the form of February permits and starts, finally caught up after the government shutdown. Two sources of house price data were also released this morning. The bottom line is that, depending on how you measure, housing construction is likely either at or just slightly above a short term bottom. Price growth, meanwhile, continues to decelerate. I have a more detailed analysis in the queue at Seeking Alpha. Once it is published, I will link to it here. UPDATE: Here’s the link to the Seeking Alpha article. As always, reading this not only should help you understand what is going on this important market, but rewards me a little bit for my efforts. As you can imagine, the big news was about the fact that almost every single yield curve there is – except the one I report on every week in that post – inverted yesterday. Also, as I mentioned in an e-mail to a couple of folks this morning, the big thing that bothers me is that ***EVERYONE*** is watching it. And a forecasting tool that everyone pays attention to, ceases to be an accurate forecasting tool. It’s called “Second Order Chaos.” Humans are very clever and intelligent chimpanzees, and when you observe them, they observe you back, and react to the observation. Anyway, as usual, clicking over and reading helps reward me with a little $$$ for my efforts. The newly-widened Panama Canal opened to traffic in late 2016. Since then, there have been several ongoing disruptions in how goods are transported from suppliers in Asia to their ultimate markets in the US, including affects on seaports, trucking, and rail. This post is up at Seeking Alpha. As usual, clicking over and reading should be educational for you, and helps reward me for my work.